New Life- More Than Just A Church - 4701 Golden Gate Parkway | Naples, FL 34116 | 239-643-5433 | Pastor Paul L. Getter - Are We Guilty Too? 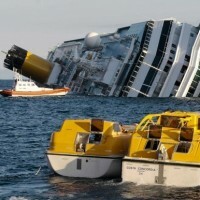 "The Italian coast guard angrily ordered the captain of the capsized Italian cruise ship to go back aboard to oversee the evacuation, but he stalled, according to an apparent recording of their radio exchange played on national television.Captain Francesco Schettino is in jail, accused of multiple manslaughter, causing a shipwreck and abandoning ship. He denies all wrongdoing and was questioned by magistrates on Tuesday.The audio recording, on newspaper Corriere della Sera's website and played on national state television, reflected the chaos and confusion in the minutes after the Costa Concordia, carrying more than 4,000 passengers and crew, hit a rock off the Tuscany coast on Friday night and keeled over. Schettino, who had already taken to a lifeboat, can be heard talking to a coast guard official based in the western Italian port of Livorno." The captain of this cruise ship is now being charged with manslaughter because he apparently did not do everything possible to save the lives of those that went down in this tragic event. The startling question that we must ask ourselves is "Are We Guilty Too?" Day in and day out we pass by a world that is sinking into the pains and turmoils of this sinful world. As the church we have the life preserver to save their soul. The answer to every crisis one may face can be found in Jesus Christ. To the drug addict that sits on the side of the road hopeless and helpless- We have the answer! To the alcoholic who drinks his life away- We have the answer! To the broken abused wife who finds herself lost and in despair- We have the answer! To the man or women that simply wanders aimlessly in this world with no direction for tomorrow- We have the answer! As the church of God we know that Jesus Christ is the only One that can truly make a difference! Jesus is the only One that can put the shatter pieces back together. We hold the answer that this world is looking for. We hold the life preserver in our hands. We are in the boat that will never sink. Yet, in all this we can be guilty of not doing everything we can, to reach the lost. I challenge each one of us to Sound the Alarm- Reach the Lost- Win Souls- Tell someone about Jesus before it is too late!